Lifespan: At least 4-5 years under favorable conditions. Leaf retention: Evergreen in regions without freezes. Mature Size: 1-3' high and 2-4' wide. Flowers: Purple, pink or white, arrayed in vertical spikes. Bloom: Summer. Some cultivars may not flower. Leaves: Light green to dark green with purple undersides, depending on cultivar, thick, fleshy, scalloped edges, strongly fragrant, edible. The flavor has been described as strong oregano with a minty pepperiness. Stems: No thorns, easily broken. Roots: Not invasive; tap root. Wildlife: Attracts pollinating insects. Not browsed by mammals. Toxic / Danger: No danger to humans. Poisonous to dogs, cats and horses. Origin: East and southern Africa. USDA hardiness zones: 10-11. Root hardy to 9a. This plant dies to the ground in freezes and recovers from its roots in the spring. Sun: Full sun to part shade. Part shade is recommended in high temperature regions. Water after becoming established: Monthly to twice a week depending on temperature and sunlight. Soil: Very well drained, tolerant otherwise, pH 6.1-7.8 (slightly acidic to slightly alkaline). This plant can suffer from root rot in wet soil. Mulch: Yes, to retain soil moisture and protect roots from temperature extremes. Planting: Can be grown in pots, even indoors. Litter: Low except it dies to the ground in freezes. Propagation: Cuttings or seed. It easily roots from cuttings. Uses: Ornamental, culinary. The leaves are used to flavor meat stuffings, soups, tomato sauces, and more. 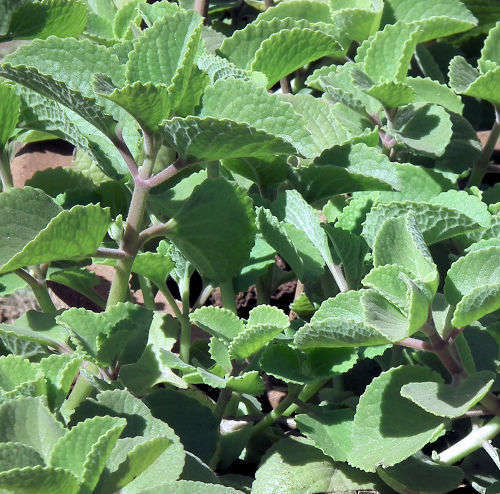 This plant is a member of the Mint family (Lamiaceae). Another common name is Spanish Thyme.